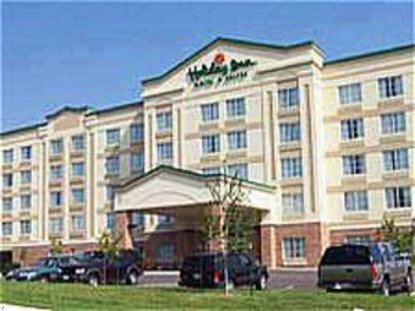 The Holiday Inn Hotel & Suites Convention Center Overland Park is conveniently located near The Overland Park Convention Center, Sprint World Headquarters Campus, Embarq Headquarters, Corporate Woods, South Creek Office Park, Mid-America Rehabilitation, Black & Veatch & Yellow Roadway. Complimentary high-speed and wireless Internet access available in all guest rooms and meeting rooms. Upscale shopping and fine dining at Town Center Plaza...less than one mile away Hotel features Ed's Restaurant, serving casual American fare for breakfast, lunch and dinner. Room service available. All suites feature a mini-refrigerator and microwave, cordless phone and underground parking garage access. Jacuzzi suites also available. Guest appreciation nights (every Monday through Thursday evening) includes a complimentary cocktail and hors d'oeuvres. Complete meeting and banquet/catering service available for any event. Please contact the property directly for details. This hotel is committed to providing accessible facilities under the American Disabilities Act. If your accessibility needs are not met, please contact the Hotel Manager on Duty. Should you require additional information regarding accessible facilities for guests with disabilities, please call 1-800-Holiday (U.S. and Canada) or contact the hotel directly. For the hearing impaired, TDD service is available at 1-800-238-5544 within the U.S. and Canada.